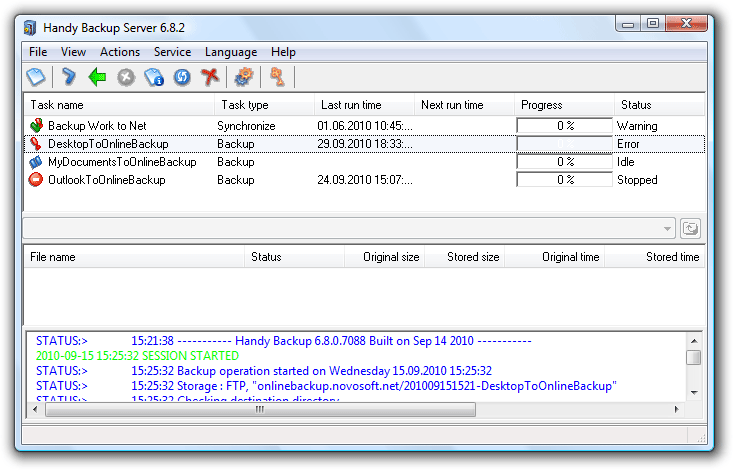 Handy Backup Server is an all-included enterprise backup software for Windows 2008/2003 Server and Windows 7/Vista/XP/2000. It has everything that can be demanded from network backup software by small businesses. The utility can do incremental and differential backups of files and HDD disk images of both networked workstations and the central server, supports backing up of MS Exchange, MS SQL, Oracle, DB2, Lotus Notes, My SQL and other databases. ...... files and folders, but also creating drive images - backups of operating system and all applications. All workstation backup tasks are fully automated and run with low system priority which allows performing them during work hours. Comprehensible user interface provides easy step-by-step adjustment of network backup, with options of compression, encryption and flexible task scheduling. * E-mail notifications, command line interface, Windows Explorer integration and log file generation ease task management by system administrator. Besides files, folders and HDD images, the program features plug-ins for backing up MS Exchange, MS SQL, DB2 databases and Lotus Notes/Domino data stored on the central server. Also, you can back up Oracle database and ODBC-compatible databases that can be located on both local server and remote workstations. Qweas is providing links to Handy Backup Server 7.20 as a courtesy, and makes no representations regarding Handy Backup Server or any other applications or any information related thereto. Any questions, complaints or claims regarding this application Handy Backup Server 7.20 must be directed to the appropriate software vendor. You may click the publisher link of Handy Backup Server on the top of this page to get more details about the vendor.